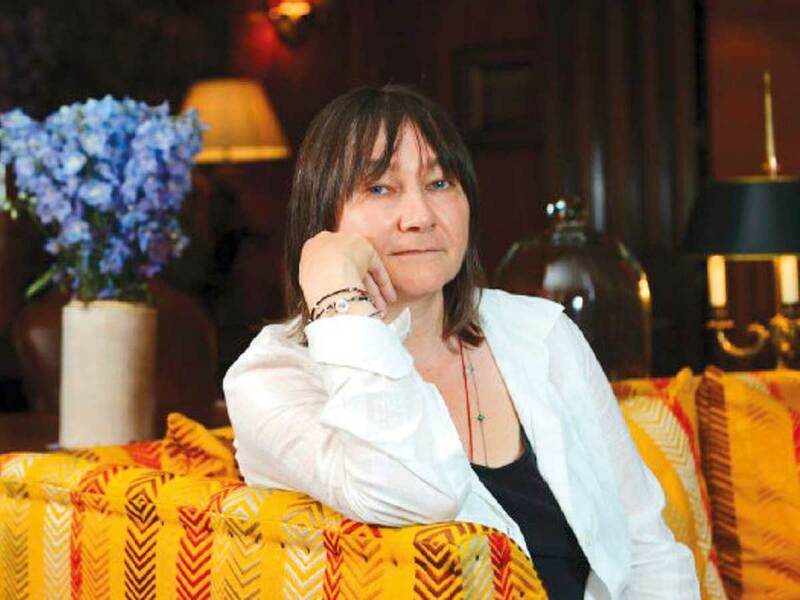 After a will-it-won’t-it panic followed by a sudden burst of giddy life, Ali Smith’s Seasonal Quartet is blooming into its third season, Spring. With just 10 days to go until its official publication, books have yet to arrive from the warehouse. The nail-biting hiatus eerily mirrors a political week in which Brexit has twice been stalled in the British parliament — except that, unlike Brexit, Spring is definitely happening. Smith has been watching events unfold — or fail to unfold — from a worker’s cottage in a tiny terrace in Cambridge, one of two that she shares with her partner Sarah Wood and their five cats. Outside, the new season is doing its thing, beaming bright sunshine one minute and hurling sleet the next, on to a little garden vivid with blue grape hyacinths. But don’t be fooled into thinking the quartet was conceived as a response to the current constitutional crisis, warns Smith: “the truth is much stranger than that”. Its origins go back to 2015, a time when the two political overthrows that have come to dominate the news — and the novels — were pretty much unimaginable. An American outsider called Donald Trump had just launched his presidential campaign and a British prime minister called David Cameron was struggling to control his party. With Spring safely delivered, Summer is already forming in Smith’s mind, but she won’t sit down to write it until four months before its delivery date next March. Autumn, published in October 2016, alludes to the murder of MP Jo Cox four months earlier; Winter, released in November 2017, took in Donald Trump’s fortuitously unseasonal pronouncement in July that “We’re going to start saying ‘Merry Christmas’ again” . Spring is about truth, art and historical injustice; it is about the magic of coincidence and the urgent need to break the cycle of misinformation that has us careering towards climatic cataclysm. Smith drapes these monumental themes around four central characters. Richard Lease is an elderly film director who has been asked to make a film about Katherine Mansfield and Rainer Maria Rilke in 1922, when both writers were convalescent in the same Swiss resort but appear never to have met. Brittany Hall is an officer at a detention centre, and Alda Lyons is an out-of-work librarian who hangs out in a sleeping bag in a disused coffee truck. The person who brings them together is one of Smith’s magical characters (think Amber, the uninvited guest in 2005’s The Accidental, whose mayhem transforms an unhappy family, or George in How to Be Both, whose grief and gender uncertainty conjure a female incarnation of a Renaissance artist from the walls of art history). In Spring the role is played by a 12-year-old girl called Florence who infiltrates the detention centre where Brittany works — a hellish place of “body cams, razor wire, deets [detainees]” — and then spirits her off on a train to Scotland, where they meet up with Richard and Alda for an impromptu road trip. Their destination is Culloden, scene of the 1746 battle in which the Hanovarians finally defeated Bonnie Prince Charlie’s Jacobites, thereby perpetuating the union of England and Scotland. The battlefield is just outside Inverness, where Smith grew up in a council house backing on to the Caledonian canal, “which shipped stuff south, mostly soldiers for Victoria’s army”. Her father, Don, was an electrician who installed wiring to houses throughout the Highlands while running an electrical shop in the covered market. He was from Nottingham, while her mother, Ann, was from Northern Ireland. Smith was the youngest of five children, a surprise, born six years after her youngest brother. “I was really lucky. I had an easygoing existence with a family that was already there, which I was part of and not part of,” she says. When she was small she wanted to be a refuse collector. “I thought it was the most romantic thing you could be because down the road came a truck full of the most interesting things, all thrown away.” Writing, she says, “was something I could just do, but I could do a lot of things.” Such as? “I was quite good on ponies for a few years.” She helped out at the local stables for five years before they were demolished. How far away is it, Florence asks before they set off for the battlefield: “It’s by my estimate, let’s see now ... One legend and a couple of old songs away,” replies Alda. Their exchange serves as a reminder that, for all its responsiveness to current events, Smith’s quartet is also developing into a new mythopoeia — a constellation of stories capable of capturing and expressing our space and time with a truth that is beyond the news feeds. Each of the novels is hitched to one of Shakespeare’s late plays — in this case Pericles — and each invokes a real artist. In Autumn it was the pop artist Pauline Boty, in Winter, the sculptor Barbara Hepworth, and in Spring it is Tacita Dean , one of whose cloud drawings is reproduced at the end of the novel. In one of those not-quite-coincidences that pepper the books, the drawing is titled Why Cloud — which just happens to be taken from a line in Pericles, when the Prince of Tyre struggles to solve the first of the play’s riddles. Though Smith’s novels are in constant dialogue with high art — from Ovid’s myth of Iphis in Girl Meets Boy (2007) to the Renaissance painter Francesco del Cossa in How to Be Both — ephemera is also important to them, not least postcards, which provide occasional unsignalled communications between the different volumes of the quartet. Daniel, the 101-year-old neighbour in Autumn, once sent a postcard to Sophia, the elderly grouch in Winter. The deed is not as significant as the artefact — in that case a picture of a small girl covered in dead leaves, which was taken by the French photographer Edouard Boubat in 1946. She carried the image with her through a Cambridge degree, a PhD in American and Irish modernism, a stint as a university lecturer in Strathclyde, and into a writing career that saw her quickly announced as a rising star. By the time Smith published her first, award-winning short story collection, Free Love and Other Stories (1995), she had already had four plays produced on the Edinburgh stage. She has fulfilled her potential at every turn, managing with How to Be Both to win a Costa prize, awarded to “the most enjoyable books of the year”, and a Goldsmith’s award for innovative writing (not to mention the Baileys women’s prize for fiction). A poll of 200 critics, academics and authors conducted by the Times Literary Supplement last year proclaimed her the best British or Irish novelist writing today. Politics, as she told Sturgeon, is the opposite: “Where our stories meet other stories or block other stories; and where people decide that other stories can’t be heard because my story is more important than your story — all that stuff — you could call it politics.” For that reason, as much as any other, she does not consider it a coincidence that the quartet has come to her now.